Felix Baumgartner lifts his arm in victory moments after landing. Photo by Red Bull Stratos. Austrian athlete and daredevil Felix Baumgartner broke the speed of sound on Sunday, after riding a balloon to the edge of the stratosphere and leaping headfirst into thin air over Roswell, New Mexico. He jumped from 128,100 feet — that’s a height of 24.2 miles — and hit a maximum speed of 833.9 mph during a freefall that lasted four minutes and 20 seconds. The jump broke records for the highest balloon ride and highest and fastest skydive. His speed — which reached Mach 1.24 — was faster than pre-jump estimates. 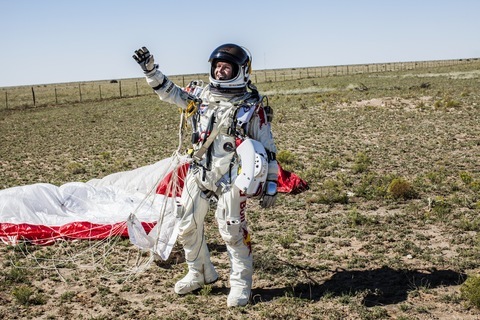 Then the 43-year-old pulled his parachute, and minutes later, landed softly in the New Mexican desert, pumped his arms in victory and dropped to his knees. 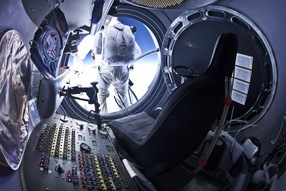 You can watch a video about the jump prepared by Red Bull Stratos here. Red Bull Stratos is the name of the mission, which was funded by the energy drink. Baumgartner left one record to retired Air Force colonel Joe Kittinger: longest freefall. Kittinger’s 1960 skydive from 102,800 feet lasted 16 seconds longer’s than Baumgartner’s. Kittinger was on Baumgartner’s support team, worked closely with him during training and advised him during the ascent leading up to the jump. At one point, during the freefall, Baumgartner appeared to spin rapidly, according to a news advisory by Red Bull Stratos. But he regained control and pulled the parachute, prompting cheers from the team’s mission control on the ground. Baumgartner’s first attempted the extreme skydive on October 9, but the launch was aborted by mission control due to gusty winds, following a five-hour delay. High winds had proved too dangerous for the fragile balloon, and just before 2 p.m. ET, the balloon was deflated and the Austrian athlete, visibly disappointed, unfastened his helmet and stepped out of the capsule and into his personal trailer that sat waiting for him on the launch pad. The dangers were enormous. If his body was not positioned correctly, he could have fallen into a rapid spin, which could render him unconscious and cause brain and cardiovascular damage. Plus, he faced the risk of ebullism, a condition that could cause the liquid in his body to turn to gas and his blood to literally boil. 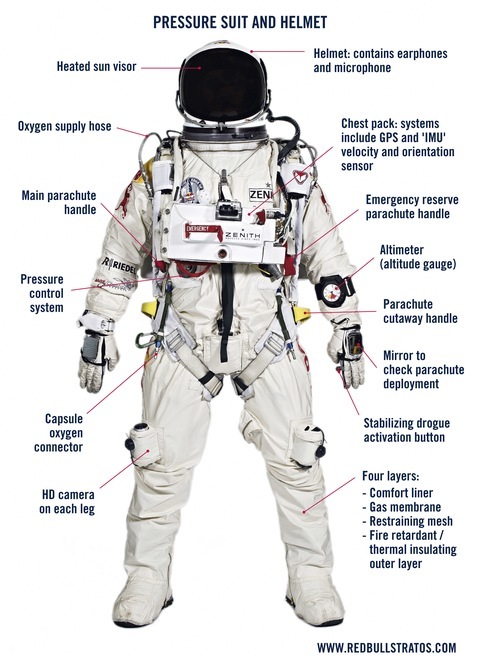 A custom spacesuit was designed to protect him from -70 degree temperatures and low pressure at the extreme altitude and maintain the oxygen and pressure levels he’ll need to survive at supersonic speeds. Baumgartner began skydiving at age 16, and by the 90s, had graduated to base jumping. He has base jumped from the world’s tallest building in Taiwan, from the world’s tallest bridge in France and from the Christ the Redeemer statue in Rio de Janeiro, Brazil. In this Red Bull Stratos video, narrated by Baumgartner, he talks about his extensive base jumping and skydiving history and his philosophy on extreme sports. 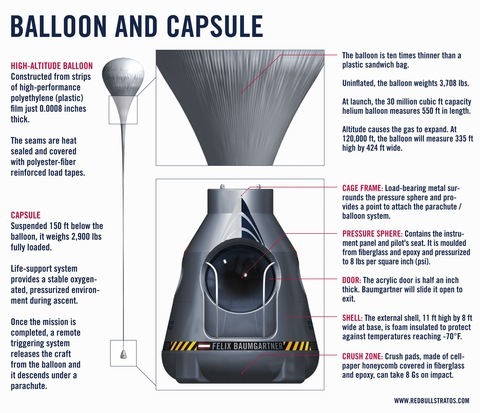 Image credit: The graphics above show Baumgartner’s space suit, helmet and capsule. Images by redbullstratos.com.